With the Birth of the Demolish event in the Clarence Valley, NSW and the introduction of some easy rapids on the paddle stage at Clarence river rush, we have been inundated by surf ski paddlers who are itching to give it a go but want a fast ski or kayak to take down the river. Being an easier river with no major dangerous obstacles along the way, this section of river is possible to navigate using your favourite fast ski or even convert an older one to do the job pretty cheaply…It may even be handy if you would like to do more river training but have a lot of weed in your local river system. Ideally a trailing rudder that kicks out of the way is better than an understern if you happen to veer of the best path or hit a shallow patch of water or a stick just under the surface… so maybe a self-made trailing rudder might be for you? These are nothing new and can be as fancy and well-made or as basic as possible to get the job done. 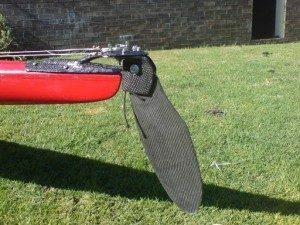 With a few minutes of planning and some simple DIY nous and maybe a few bucks of materials from a hardware store, you will be able to rock your own DIY rudder for river paddling in weeds and being able to take on your first rapids paddle race in a ski you know and trust. If that’s not your thing, then we can hook you up with kayak hire of varying kinds and prices. Contact us at info@adventurethon.com.au to arrange this. You can also check out the KAYAK HIRE page for more info. There are a number of easy to follow plans online – check out this one we found. Very simple step by step process (and if you are in a ski it’s even simpler to complete). “Yakhak” set out to make a rudder that was more useful than a plank on a stick (lol) and he has documented the step by step guide for us. If you would like to look at his methods more closely, check out his step by step guide HERE. NOTES- you will need to modify this concept on a ski but it’s a great idea to spur you on. One of our awesome Adventurethoners, Dave Morris, has made a special rear rudder fitting for his fenn ocean ski, utilizing his epic v7 trailing rudder to fit on to it! Now that’s clever! Martin Gunda created an overstern rudder – you can see his images and ideas HERE. Me, Join a Team, Why?